Place the bacon in a large skillet over medium heat. When the bacon is partially cooked, add the onion. Cook until the bacon is done and the onion has lightly carmelized. Remove the bacon/onion mixture from the skillet and set to the side. Pour off most of the bacon fat. Add the chopped asparagus and lightly stir fry. Remove the asparagus from the skillet. Reduce the heat to low, and add the butter. Once the butter is melted, add the cream and stir continuously. When the cream begins to warm, add the shredded parmesan. Continue to stir and cook over low to med/low until the cream mixture thickens slightly. 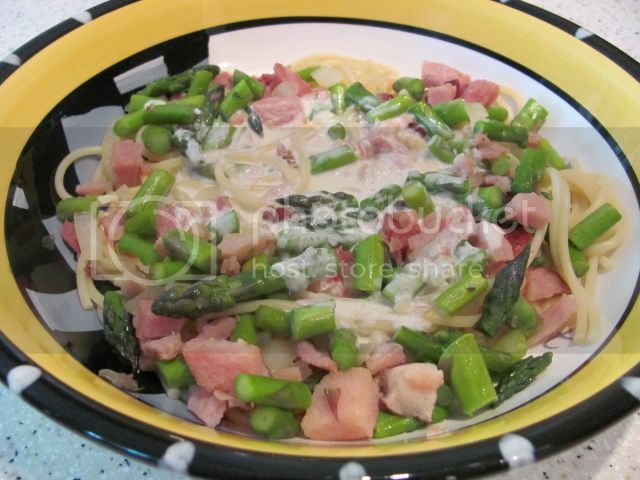 Place the bacon/onion/asparagus mixture over the cooked linguine and pour the sauce evenly over the top. Garnish with the chopped roma tomatoe and some extra parmesan cheese. This makes about 3 large or 4 normal servings. It is a very rich dish. Oh man! What's not to like about THAT??? Did a little variation on this last night. Used pancetta molinari instead of the bacon. OH LORD that looks soooooooooooo good!! You know some recipes you can look at and but the flavors together in your mind, and this looks like a winner! all the things I like too. great pics! Anything with bacon and asparagus can't be anything but good! Cooksie, did you miss the smokey flavor of the bacon when you used pancetta? I always do. Ergo, I don't bother with pancetta any more. Cooksie, I have had the recipe saved and keep saying I am going to make it, but I haven't yet. Will do soon. This is too gorgeous NOT to make... AND it's easy,which is what I like! I didn't really miss the smokey flavor in this when I subbed the pancetta for the bacon, maybe because there's so much else going on in the dish. I do love my bacon though and would miss that flavor in a BLT for sure. I must make this sometime this summer! Peeps, I'm cheap, so I use the pkg of pieces of spiral cut ham slices. A nice smoked ham steak cooked in cast iron with a little sear would probably be great. Dang, forgot the tomato :blush:. That looks really good! I haven't had bacon for quite some time now, I just might have to cook that as well.